-It is a fertile land split by a desert. rumor has it that there is a vast treasure in the center of the desert, hidden in the Grand Oasis. 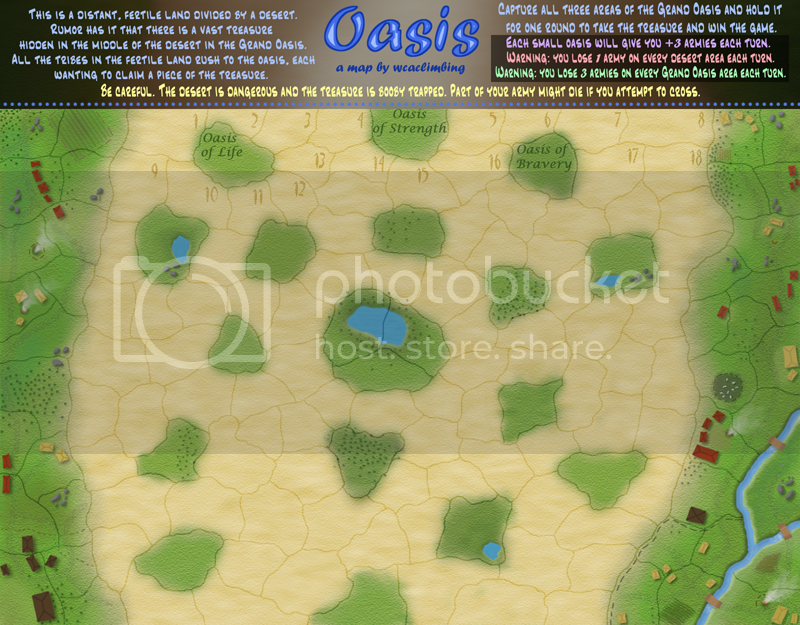 All of the tribes living in the fertile land rush to capture the Grand Oasis, each wanting to claim the treasure. If you control the entire Grand Oasis for a turn, you win the game. 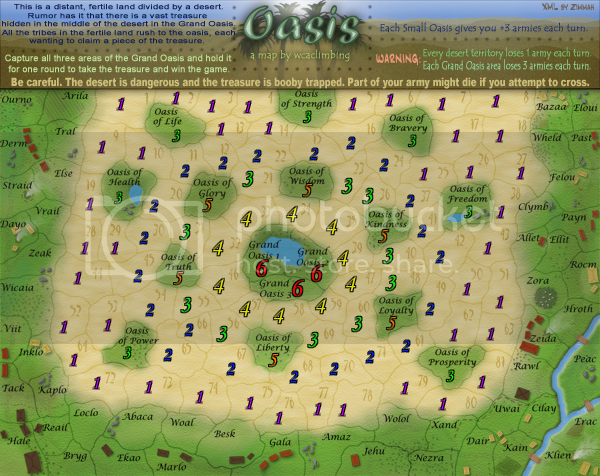 -All of the fertile land is split between the players. -Each of the desert areas (tan) will have neutrals on them. 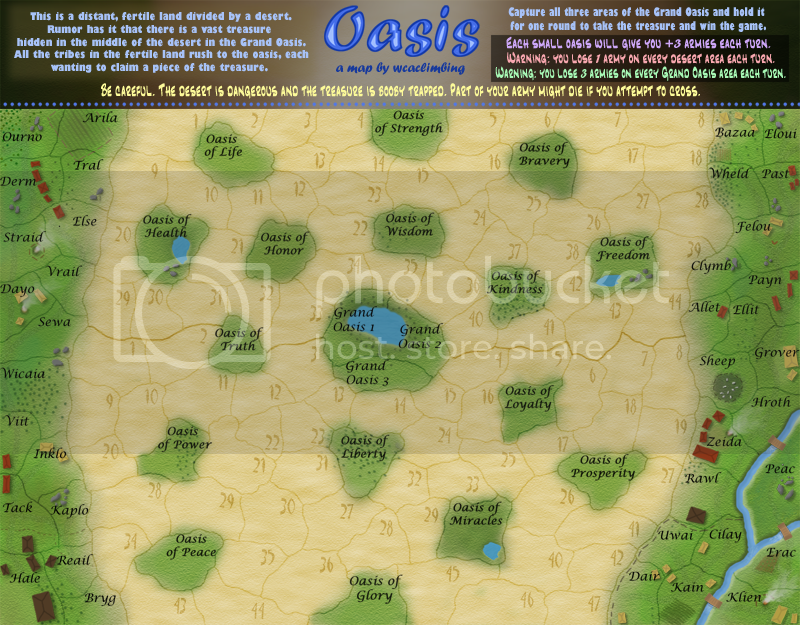 1s and 2s around the edges, 3s and 4s as you get closer to the Grand Oasis. 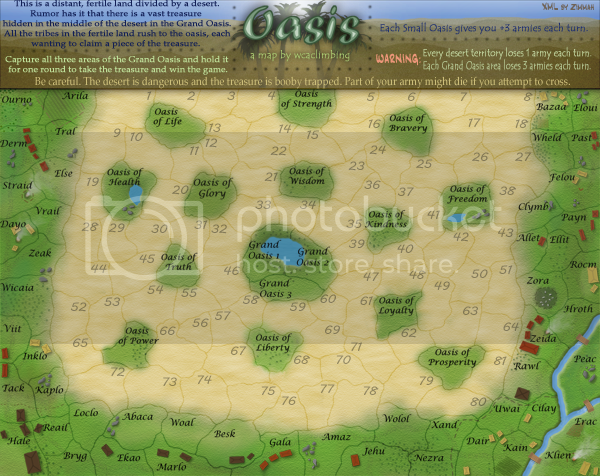 -Each small oasis will have 3 or 5 neutrals, depending on how important that oasis is. 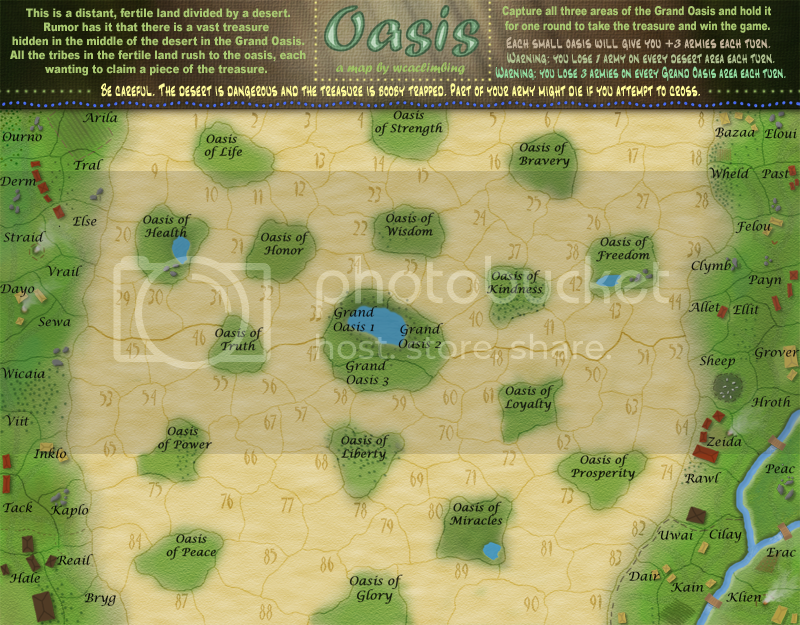 -Each section of the Grand Oasis will have 6 neutral armies on it. -Each small oasis will give a +3. This is a strategy map. Lots of possible strategies to win (rush to the Grand Oasis, Kill the people in the fertile land, take all the small oases, etc.). 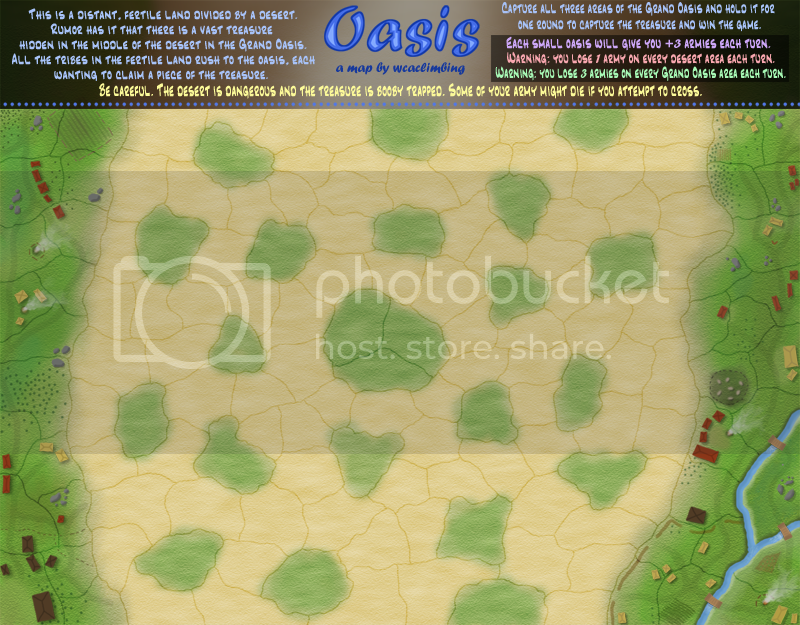 It will be a good challenge to play, and it will make for a very fast paced game with everyone fighting over the very limited resources, and then the final war for the Grand Oasis. Last edited by wcaclimbing on Tue Nov 04, 2008 1:17 pm, edited 102 times in total. I like the start. Like I said in the map ideas thread, it needs more territories (way more), but it can (and will, I hope) work. I agree it needs more. The oasises(sp?) need to be like check points that help you cross the map. I really like it, the gfraphics are awesome for a first draft, i like the idea of the map, although as InkL0sed said it needs more territories. militant wrote: I really like it, the gfraphics are awesome for a first draft, i like the idea of the map, although as InkL0sed said it needs more territories. The players start on the side, where it's green. I just had a cool idea What if there were 16 possible starting areas, all only able to one-way attack the desert? That way this could be the only map where you have to win by getting the objective, since you could never get the original starting point. 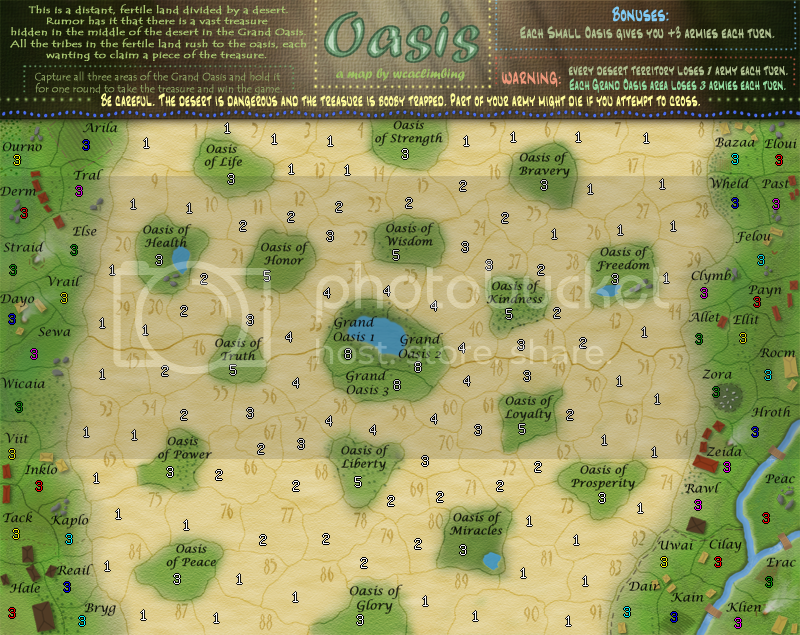 Things would have to be adjusted, of course; The Grand Oasis would need many more neutrals (probably more territories too), for one. Last edited by InkL0sed on Sun Feb 17, 2008 1:19 pm, edited 1 time in total. the texture for the green territories is great, you should keep it. InkL0sed wrote: I just had a cool idea What if there were 16 possible starting areas, all only able to one-way attack the desert? That way this could be the only map where you have to win by getting the objective, since you could never get the original starting point. The idea of forcing the objective just doesn't seem to work well for me. 1. I want to leave the option of killing your opponents open. Since it should be kinda like tribes fighting over a treasure, the option would have to be there to be able to kill your opponent's tribes, like in real life. Cause in a real battle, if you kill all of your opponents, you get the treasure anyway, cause everyone else is dead. 2. I want to give people as much freedom as possible on this map to choose their own strategies. Forcing starting positions really limits the amount of options you have. Lots of possibilities means you face new challenges every time you play. its a pretty sweet idea, but i think that maybe there should be more neutrals as you get closer to the center, because yeah, its just sand, but it gets harder and harder to walk in it as you get more dehydrated etc. sounds like a great idea and should be continued. you should make certain fixed starting positions for the players and have the rest neutrals. If I was lying wouldn't my pants be on fire? These ideas are jsut a new phase on map making which are popular with the players, eventually thou something new will come along once the conquest idea era is over. Just a thought wcaclimbing but to get a good conquest map you must put much more thought that a clasic map into it balancing the game play or each starting point should be your main objective after you have your layout. Maybe this is me over thinking but 24 or 25 territories to start seems like a good number. And, this is quite possible with the current setup you have. I believe there are 19 fertile territories at the moment. 25 allows 3 starting places for 7,8 players, 4 for 6 players, 5 for 5 players etc.. It's good to see an objective map going. My current map is objective oriented and my next one will be objective only winning. Cause then you could add like magic carpets and djinns and a flaming scareb of death. and also, doesnt an oasis need water???? They get fed by underground rivers. i'm not into the fixed starting points. whitestazn88 wrote: its a pretty sweet idea, but i think that maybe there should be more neutrals as you get closer to the center, because yeah, its just sand, but it gets harder and harder to walk in it as you get more dehydrated etc. edbeard wrote: Maybe this is me over thinking but 24 or 25 territories to start seems like a good number. And, this is quite possible with the current setup you have. I believe there are 19 fertile territories at the moment. from what my new version is looking like at the moment, i'm thinking it will be just about 30 countries in the fertile land. that seems to be pretty good. its similar to 25, just a few extras added in for some numbers. edit: so... after working on the image some more, I don't think there will be 25 countries in Fertile, or even 30. it will probably be closer to 35 or 40. not that big of a deal, but its still quite a bit more than 25.
how would that work? change it from 1 to 3? have it increase each round (which isnt possible). 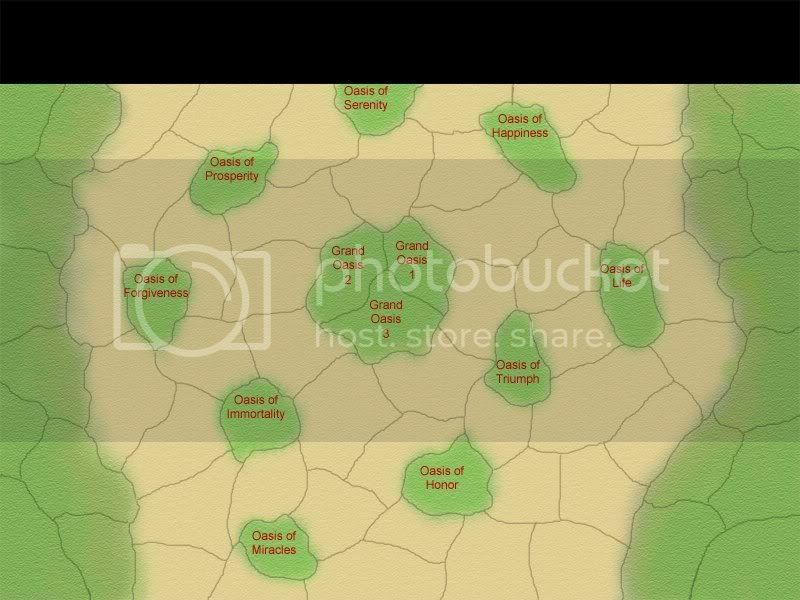 If the decay was set at 3 for the desert territories, you wouldn't be able to go anywhere cause all of your armies would be eaten by the decay every turn. anything you deploy would be gone next turn. yes. 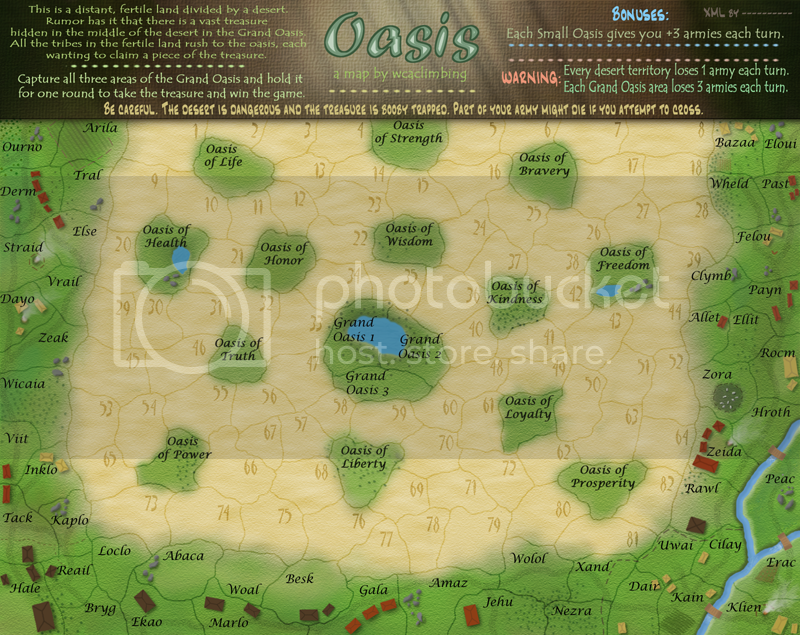 I know oases can have water. some of them will have water. --- I might be posting a sneak-peak of the next update whenever I get around to it. its looking pretty cool. Last edited by wcaclimbing on Mon Feb 18, 2008 11:25 pm, edited 1 time in total.